Share your knowledge. Create, distribute and sell your online courses easily. Manage the training of your employees, members or partners through your private platform. Since April 21st, 2015, Google favors responsive design websites in its search engine database if the search is made from a mobile device or a tablet computer. If your website is not adapted for a display on phones, it’s less likely to be well ranked in a search made from a phone. If your website is not adapted for a display on tablets, it’s less likely to be well ranked in a search made from a tablet. You might say: “I get it, but my clients use computers anyways “. And you would be right. If your customers are professionals who need continuing education, you might get 15% to 20% of visits made from a mobile device. 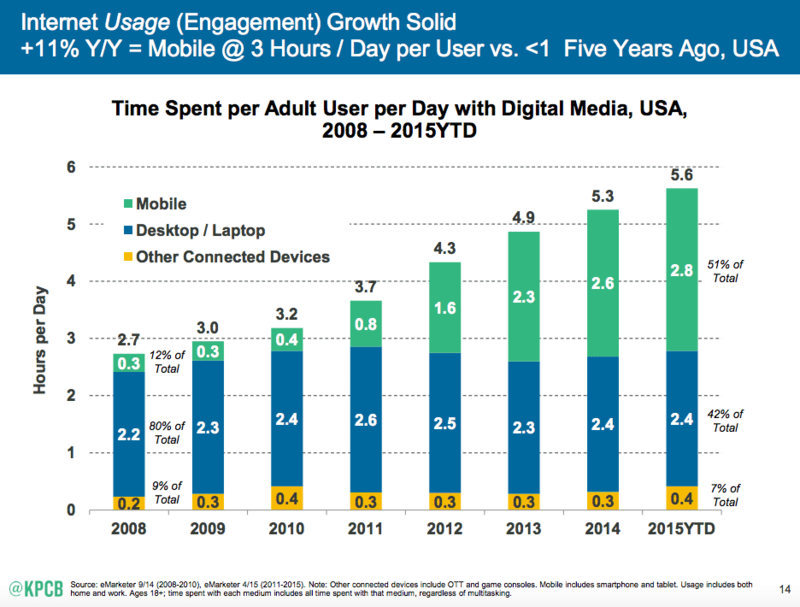 We’re still very far from the 51% of time spent online via a mobile device in 2015. But the percentage of time spent on a mobile device increases dramatically in all markets, online training included. Let’s see a few practical examples. Yoga courses tend to be popular among women and even more popular among 25-35 year-olds. Microsoft Excel courses attract a very diverse market where the median age is superior to the one in yoga. It’s often pursued for the corporate training of secretaries and clerical agents. English courses are targeted by job seekers who want to improve their chances of landing a job, professionals who want to improve their Business English skills and travelers who want to be able to communicate… In other words, it’s for everyone. It is clear that research made from mobile devices is increasing drastically in the learning industry, and it’s a global phenomenon. And the best time to get a responsive e-learning website is now!